UR Medicine Obstetrics and Gynecology is a leader in patient care, investigative research, and obstetric education. The Faculty is dedicated to promoting excellence in all areas that support women's health. UR Medicine's Strong Memorial Hospital has earned recognition from the American Association of Gynecologic Laparoscopists (AAGL), the Surgical Review Corporation (SRC) as an AAGL Center of Excellence in Minimally Invasive Gynecology (COEMIG)TM and Excellus BlueCross BlueShield as a Blue Distinction® Center in the area of Maternity Care. 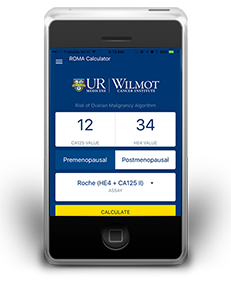 ROMA (Risk of Ovarian Malignancy Algorithm) is an FDA cleared algorithm presented in mobile application. The application is intended for educational purposes only by clinicians, who are trained in using ROMA. This application was developed by AbiTech, Inc. on the behalf of the University of Rochester Wilmot Cancer Institute.